This week we are sharing fabulous gluten-free goodies from Against All Grain. This layered chia and almond pudding is nothing short of genius. 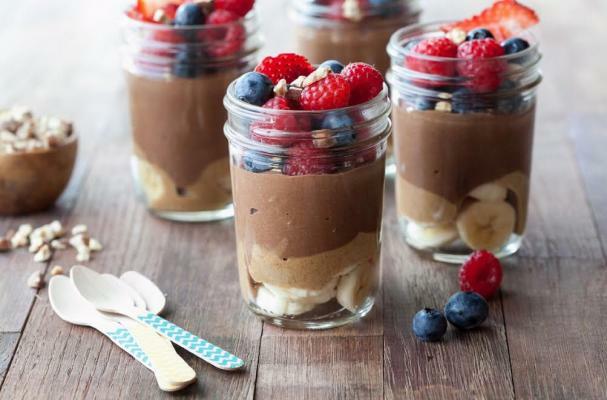 A homemade chocolate almond milk pudding is layered with fresh banana and berries and almond butter. This is definitely one dessert you can feel good about eating. Step 1: Pour 3/4 cup water into a saucepan and sprinkle the gelatin over top. Turn the burner to med-high heat and whisk until the gelatin is fully dissolved. Set aside. Step 2: Combine almond milk, dates, cacao powder, chia seeds, vanilla, cinnamon and sea salt in a blender. Blend until very smooth, about two minutes. With the blender running, slowly pour in the gelatin liquid. Transfer the mixture to a bowl, cover and refrigerate overnight. Step 3: To assemble the parfaits: Divide the banana slices between six 8-ounce Mason jars or bowls. Spoon equal amounts of almond butter into the jars, then top with equal amounts of the chilled pudding. Top with berries and almonds and serve immediately or refrigerate covered for up to three days.